To visualize the topological strcture of network connections, ROI coordinates are expected as the centers of spheres. In the current function, coordinate of each number-tagged ROI is calculated as the center of mass with weights and then exported to a *.csv table. The current function extracts coordinates for each cluster and output to a table. mask*: optional. mask to do AND operation with. 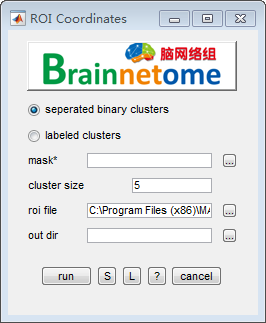 cluster size: threshold of cluster size.